These cloth drawstring bags are made of 100% woven cotton and are incredibly sturdy. Even the drawstring ties are made of cotton and are very resistant to pulling. They will hold almost anything, yet still allow ventilation. These cloth bags are ideal for storing or shipping parts, hardware, samples and countless other items. The mailer version comes with a sewn-in address tag, with ample room for addressing and postage. Size tolerance is 1/4" in each direction. 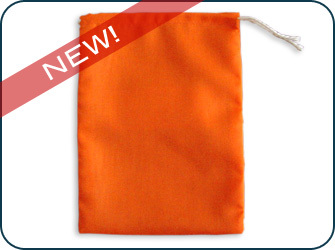 These sturdy BRIGHT ORANGE drawstring bags are 90% Polyester/10% Rayon with cotton drawstrings. If you want your bag to stand out, you can't miss the bright orange fluorescent color of these bags.